TR530 Time Recorder is intended for facility access controls, attendance logging, employee time record tracking and job management, and other applications. This device utilises RFID cards or magnetic cards or bar code cards as the identification storage medium for each authorised user seeking access to the facility. The TR-530 scans transponders without contact via 125Khz basis. The transponder ID is read with subsequent time stamp. The device has a port to connect to an external alarm system and a port for automatic unlocking of the door buzzer. The device is controlled with RS232 or with a serial to Ethernet converter DS-100 via the network. Data loss is impossible, even if there is a loss of power. 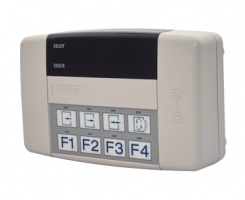 The device can store up to 10,000 entries and has 8 freely programmable function keys as well as 28 freely adjustable time zones for activation of the security system alarm.